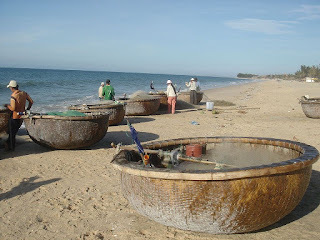 Vietnam is the only land where coracles remain in widespread use and continue to serve a significant economic function. They are ubiquitous along the coast in the central part of the country, where they serve in the roles normally filled by inflatables and hard-shell dinghies in other parts of the world. They are also to be found in country's northern and southern portions. 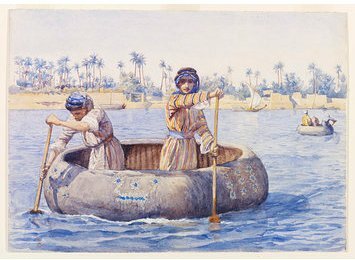 In Coracles of the World, Peter Badge states that coracles are carried aboard almost all larger fishing boats, where they are used as tenders and for handling nets. They are also used for net fishing in their own right as much as a mile offshore. In flooded-field agriculture, they are used to gather vegetables and spray fumigants. In some flood-prone areas, almost every home has a coracle for emergency evacuation, and no doubt they are also used for all sorts of casual transportation. 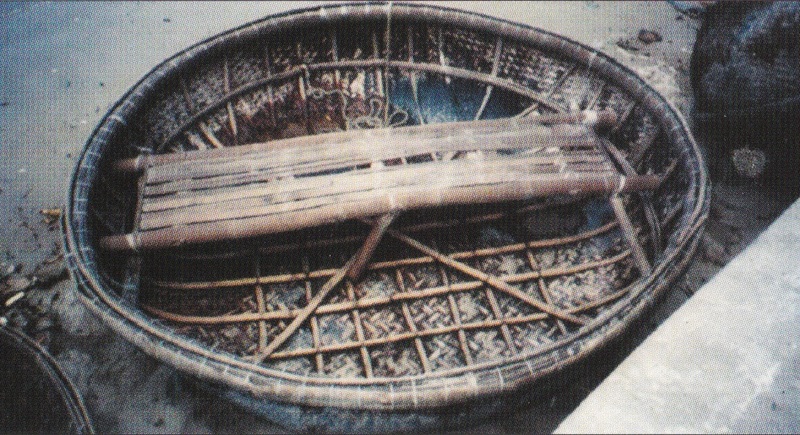 Small coracle in use in flooded-field agriculture. The Vietnamese coracle is a true basket boat. 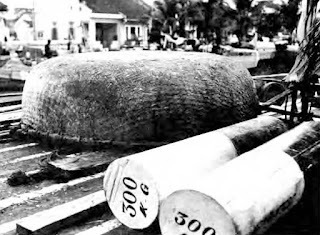 Construction begins by erecting a round gunwale of split bamboo on top of short posts driven into the ground, so that the gunwale is supported at its ultimate height above the bottom. Woven matting is then placed over the gunwale, pressed down to the ground, and literally kicked into its desired shape. On larger versions, frames are inserted, but many smaller coracles have no frames at all. An inwale is then sprung into place so that the matting and frames are held between the inwale and the gunwale. The wales are then tied together -- originally with rattan, now usually with nylon cord. Wire was sometimes used during the transition from rattan to nylon. The weave of the mat changes at the turn of the bilge, which allows it to be formed into a bowl shape without folding or puckering. Source: Badge/Coracles of the World. 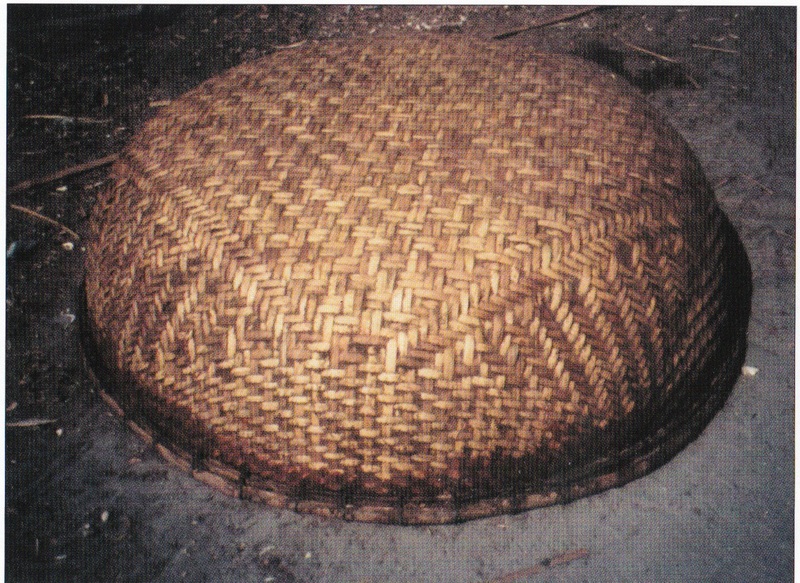 The matting is made by the coracle maker from 1-inch strips of bamboo which he himself produces. The mat is woven as a piece for each boat, with a distinct mix of weaving patterns that allows it to be pressed into a bowl shape without puckering. Where frames are used, they are usually placed parallel and at right angles to one another, not radially. Frames are tied at intersections and they are not interwoven: one parallel set is laid at right angles over the other. On larger coracles, a pair of radial frames may be inserted at right angles to one another, above and at a 45-degree angle to the first set of parallel-and-right-angle frames to provide diagonal bracing. These bracing frames are tied to the lower level of frames at the intersections. A circumferential riser frame may be tied about halfway between the gunwales and the bottom to support a sitting thwart. The exterior is waterproofed by spreading on a layer of ox dung, followed by resin from the "raie" tree, according to Badge. I can find no references to this tree online, and I invite readers with knowledge of the subject to provide further information in the comments. Sizes range from 1.2 to 3 meters in diameter, with depths from about 50cm to a maximum of about 72cm. Almost all are perfectly round, but a few oval ones have been reported, one measuring 3 X 4.5 meters. Vietnamese coracle with flat bottom and straight sides. Source: The Junk Blue Book of 1962. The cross-sectional shape varies somewhat. 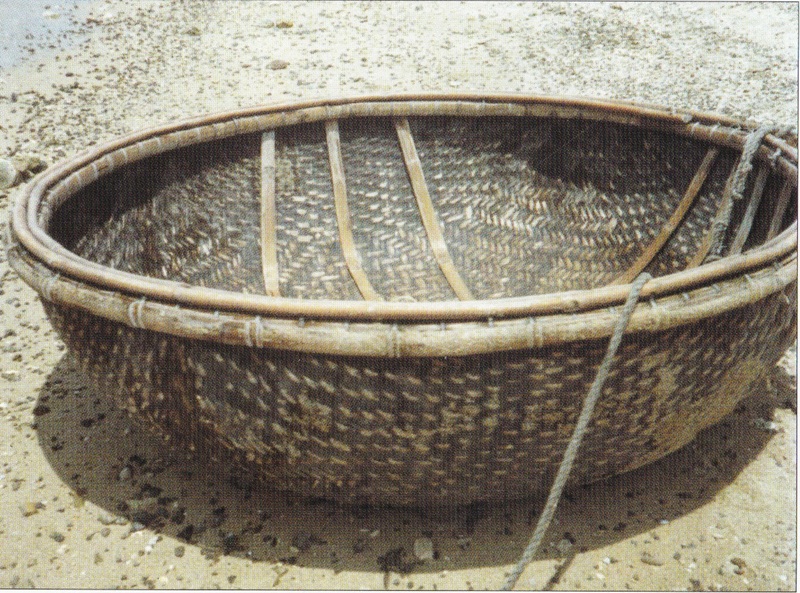 Some coracles are shaped like a shallow bowl with sloped sides. Others have nearly flat bottoms and vertical sides. A single paddle is the most common means of propulsion, with paddling done kneeling or standing or, more rarely, sitting. Paddles may have a T-grip or no end grip. They tend to be long (Badge reports a paddle 1.83 meters on a boat 1.5 meters in diameter), so that they can be used for paddling while standing and as punt poles. Paddling technique varies greatly: some use a figure-8 scull to draw the boat forward; some use a J-stroke off to one side; still others use a "scooping" technique, lifting the blade out of the water and pulling it straight back. Sometimes, the paddle is tied to the gunwale and pivoted back and forth in a forward sculling motion. If there are two paddlers, they will sit or kneel on opposite sides of the boat and use a regular canoe-style paddling stroke. The use of lugsails has been reported, but this was apparently never very popular and appears to be extremely rare, possibly extinct. Less rare is the installation of inboard engines, of which, unfortunately, I can find no details. 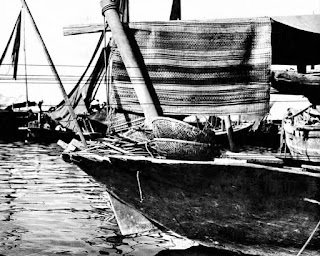 Coracles on a Vietnamese fishing junk, probably late 1950s or early 1960s. Source: The Junk Blue Book of 1962. 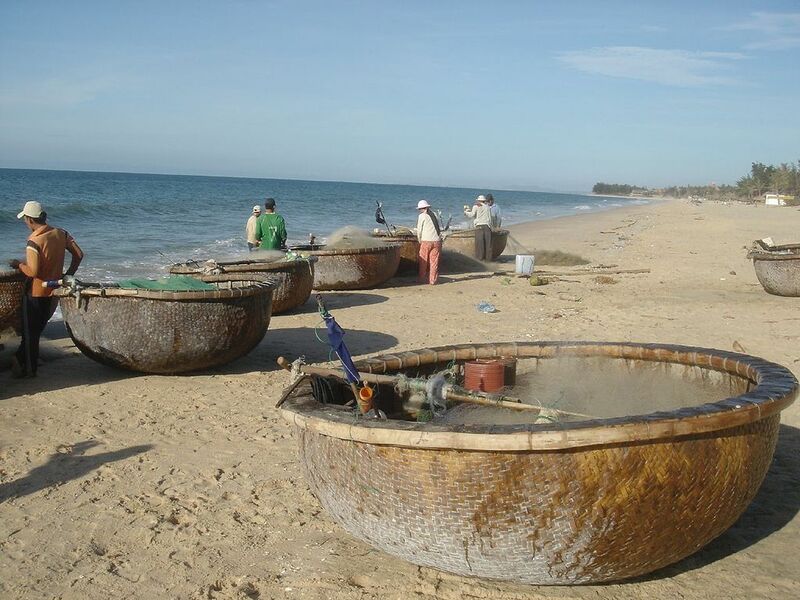 The continued popularity of the coracle in Vietnam is attributed in part to the government's promotion of the fishing industry, in which the coracle plays a prominent, practical role. No doubt, the country's relative poverty is a factor in its people preferring a boat that can be inexpensively produced on a craft basis from natural, native materials. And, no doubt, the coracle's surprising practicality, along with its entrenched cultural acceptability, are important influences as well. 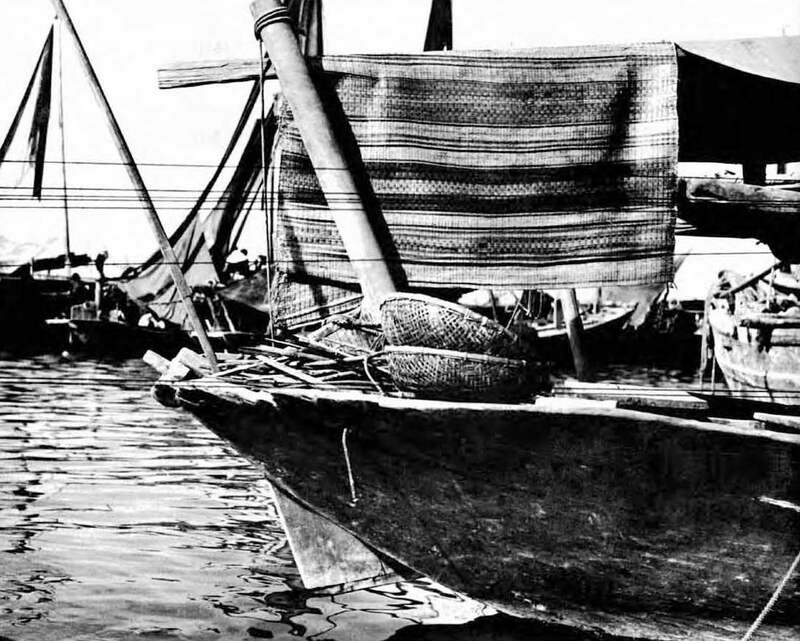 Round boats are a fascination, and the quffa, a basket-built boat from Iraq, is among the most fascinating because of its well-documented antiquity, its common use well into the 20th century, and its sometimes very large -- occasionally immense -- size. 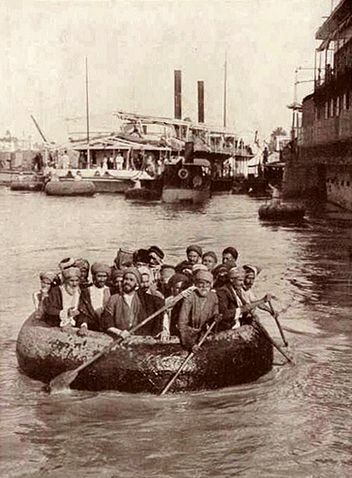 A quffa in Baghdad in 1914 (Source: Wikipedia) Click any image to enlarge. Known also as a kuphar and by various alternate spellings, the quffa was described in the 5th century BCE by Herodotus, who stated that they were built in Armenia for one-way trading trips on the Euphrates. In his account, they were round, built of willow frames and covered with leather. The insides were protected by straw. They carried wooden casks of wine from Armenia to Babylon, along with at least one donkey and two paddlers. One paddler would pull from the front; the other would push from the rear. Upon reaching its destination, the boat was disassembled and the leather cover folded up, to be carried by the donkey on the road trip back home -- the Euphrates being too swift for a return voyage. Herodotus claimed that the largest quffas could carry 5,000 talents, which is thought to be about 125 tons. This seems a probable exaggeration, although there are sufficiently contemporary and sufficiently realistic local images of unquestionably large quffas, like this one, showing four oarsmen (not paddlers) rowing with a cargo of cut stone. "...perfectly circular in plan, nearly flat bottomed, and with convexly curved sides that tumble-home to join the stout cylindrical gunwale bounding the mouth, which is several inches less in diameter than the width at mid height. In construction a quffa is just a huge lidless basket, strengthened within by innumerable ribs radiating from around the centre of the floor. The type of basketry employed is ... coiled basketry." "It consists of a spiral of reeds bundled and woven together...The reeds are woven together with a palm fibre rope and the basket is reinforced by an inner structure. Normally two quffa-builders are needed, one of the inside, and the other for the outside, as one passes the cord through the wall of the basket while the other tightens the cord...."
What's not explained in either of these quotes is the quffa's waterproofing. The exterior of the basket was covered with a layer of bitumen, of which there are high-grade deposits in Mesopotamia. There is a cuneiform tablet from Babylon, dating to around 1750 BCE and discovered in the 1940s, but not translated until a few years ago, that describes a world-inundating flood in a clear precursor to the story of Noah. In this version, the god Enki cues a man name Atrahasis to the coming disaster and suggests he build a quffa to save himself. 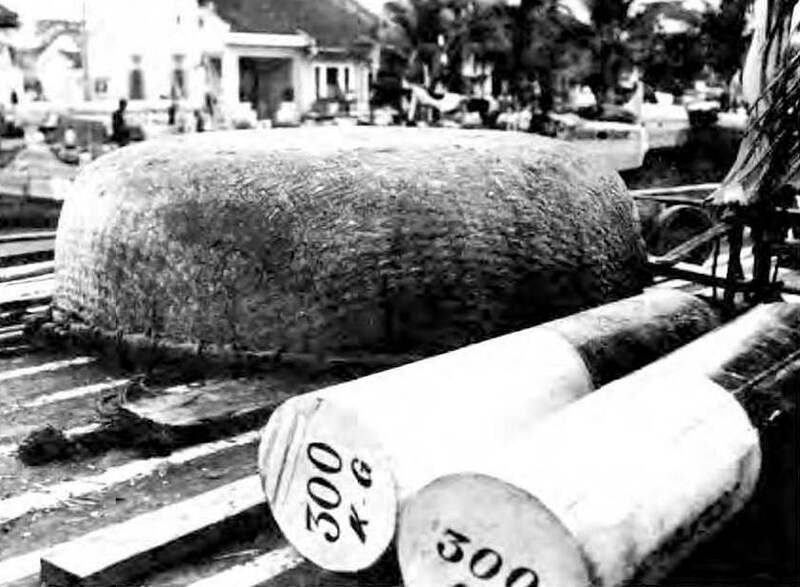 The tablet describes the boat in great detail, including its construction of reeds bound by ropes, its interior wood framing, its waterproof covering of bitumen to the thickness of a finger, and its size: a (literally) incredible 220 feet (67M) in diameter and 20 feet (6M) high with upper and lower levels. The translator of the tablet, Irving Finkel of the British Museum, acknowledges that such a craft was physically impossible and doubtless the product of some mythologizing exaggeration. 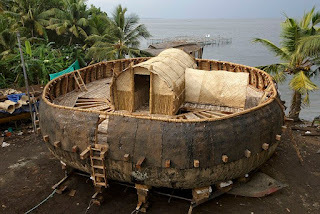 But he was so convinced of the basic soundness of the idea of a quffa large enough to serve as a model for the myth -- one capable of supporting a family and livestock for a period -- that he built a scaled-down version, which was launched in 2014. It too had two levels, with a deck house on the upper one and the lower one suitable for "lots of well-behaved animals." Finkel's 35-ton quffa leaked badly -- due, he said, to using the low-grade bitumen available in Kerala, India, where the boat was built, rather than the higher-quality stuff from Iraq -- but was stable and otherwise successful. Finkel concludes that such a craft might have actually been used and could have provided the basis for the deluge myth. A report about the project appears here. 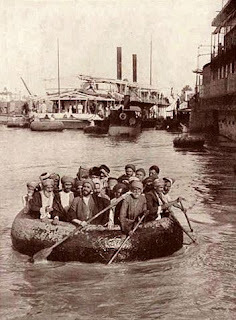 Quffas remained in wide use on the Tigris and Euphrates Rivers, and especially around Baghdad, in the first half of the 20th century as water taxis, as carriers of produce and building materials, and as lighters. Various sources reported common sizes to be 4.5 ft to 10 ft. in diameter at the opening, with depths of 2.5 ft to 4 ft. The smallest was 3'8" at the opening, and the largest 16'5" with a maximum diameter of 18'. (Because of the quffa's tumblehome, maximum diameters were regularly greater than the more easily-measured opening.) A large passenger quffa could carry 20 people. "Two Arabs in a Quffa," Arthur Trevor Haddon. In his definition of "coracle," Peter Badge includes the ability to be carried by one man as one of the essential qualities of the type. Only the smallest quffas fit this description, so if one accepts Badge's definition, most quffas can't be considered a type of coracle. 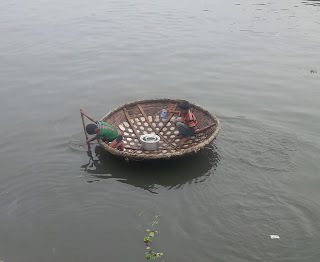 If one needs to place them in a category outside of themselves, "round basket boat" works, while "coracle-like craft" serves as a fair description. Quffa use declined with the building of bridges and roads in Iraq and the proliferation of motor vehicles and launches. I believe they no longer serve an economic function, and do not know if any are being built for recreational purposes or even for the sake of historic preservation. "I'm travelling in India and came across this scene in Kerala Backwaters. It shows the construction pretty clearly. Evidently, you can take a group outing on these (!) in Kerala if you like." The base structure is an openwork basket made of light laths, forming a very appealing hexagonal weave. 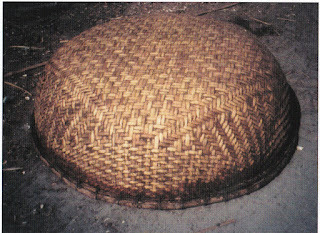 Lighter material (withies, wicker or similar) are woven under-over-under around the tops of the laths in at least 28 courses, binding them together and forcing the ends up into a shallow bowl shape. Six frames are bent into the inside of the bowl. The frames are roughly rectangular in section, and they are laid in three sets of parallel pairs at equal angles to one another. Each frame is laid either under-over-under-over the others or the reverse. A wood inwale is bent around the inside of the basket's upper edge. It appears to be roughly the same weight as the frames. It's unclear if the inwale is installed before or after the frames are in place. It's possible that the frames are forced into place after the inwale is lashed in, to tighten and stress the basket and its covering. The cover is of unknown material. It is pulled over the top of the inwale and just barely across its inside edge. The cover and the inwale appear to be lashed together to the circumferentially-woven withies at the top of the basket, but it's possible that the inwale is lashed in before the cover is stretched over it. The paddle has no end-grip. As with many other coracles, propulsion is from the "front" -- i.e., the boat is drawn directly toward the paddle. Thanks to Mr. Niemczura for this intriguing image.